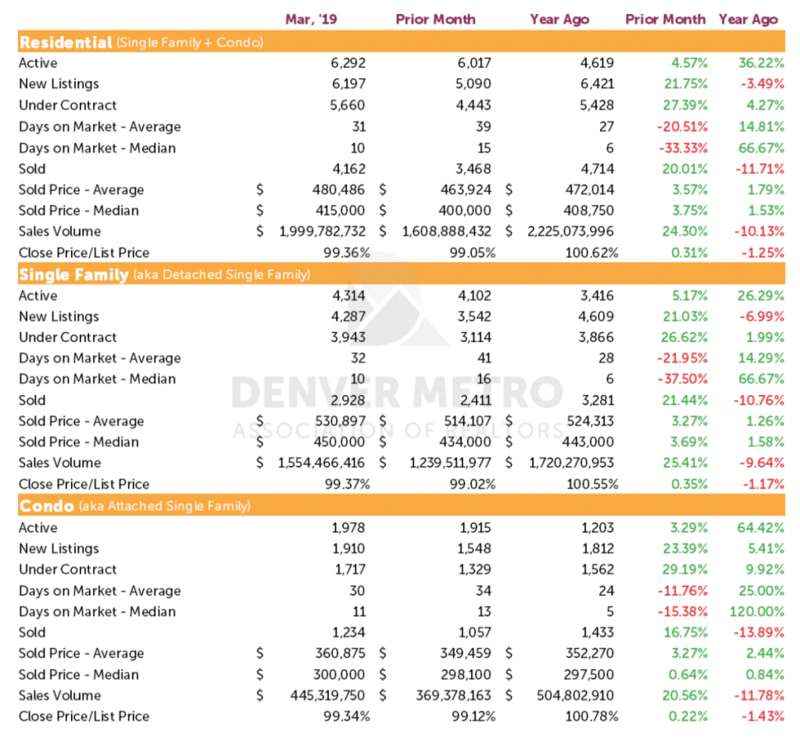 Market stats for March, 2019, compared to last month and March of last year. Denver Housing Prices Cooling. Still Competitive. 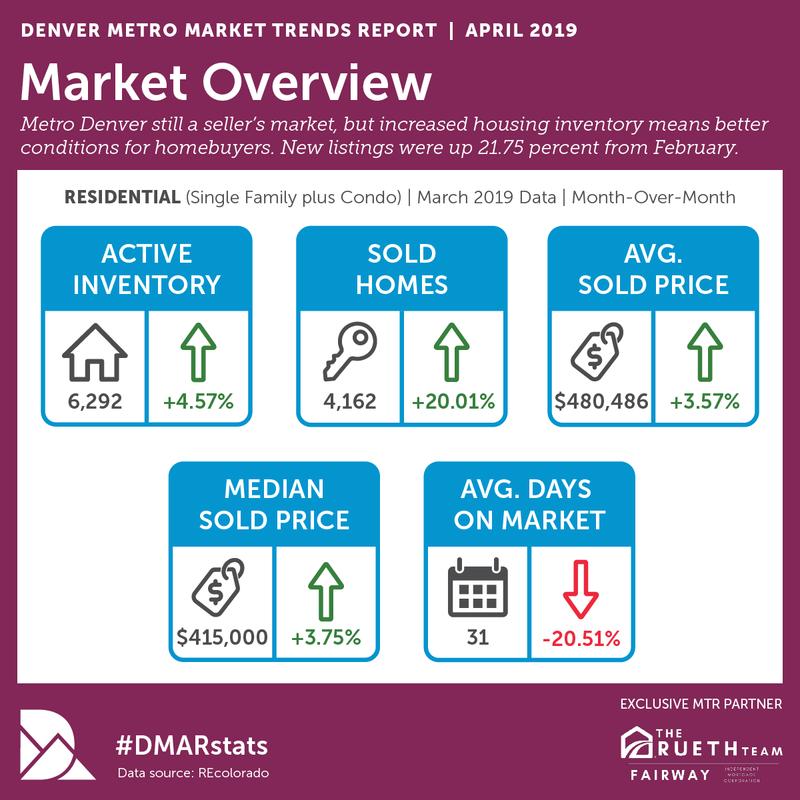 For five straight years the average home in the Denver metro area has appreciated by 10% or more every single year as we climbed out of the recession and became a national player in tech, aerospace, and natural gas. The good news – you reside in one of the most stable, attractive cities in the US. The bad news – housing will continue to rise until this changes. We simply have more people wanting to buy homes than we have houses to sell them. As you can see in the table above, prices are cooling. The median single family home sales price increased only 1.58% year over year. Basically, some listings are out-pacing the market by going active too high, so they remain on the market longer and eventually come down in price. Buyers are not as willing to pay over asking price or engage in bidding wars as they used to be. Generally speaking, we’re seeing that prices are starting to bump up against the buyers’ tolerance ceiling and even affordability ceilings. We have about 5 buyers for every home sold. The upper half of the market ($500k and up) has slowed while the bottom half of the market (below $500k) is still very fast and competitive. 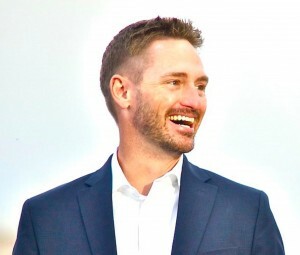 If you’re considering selling your home in the next year or two, I would recommend doing it this year, because the Fed has stated that they will not be raising interest rates again in 2019. If that changes in 2020, which I believe it will, then buyers’ burrowing power will shrink and you might have to sell for a bit less than you can this year. But that remains to be seen. Previous: Previous post: Congrats on your new Denver home Brendan! Next: Next post: Want a Free Pizza on Me? You should be on my mailing list.